Tourists visiting Goa have one common complaint about the state- it is too littered. The plastic bags and other containers just litter the streets and beaches of our favorite tourist destination. 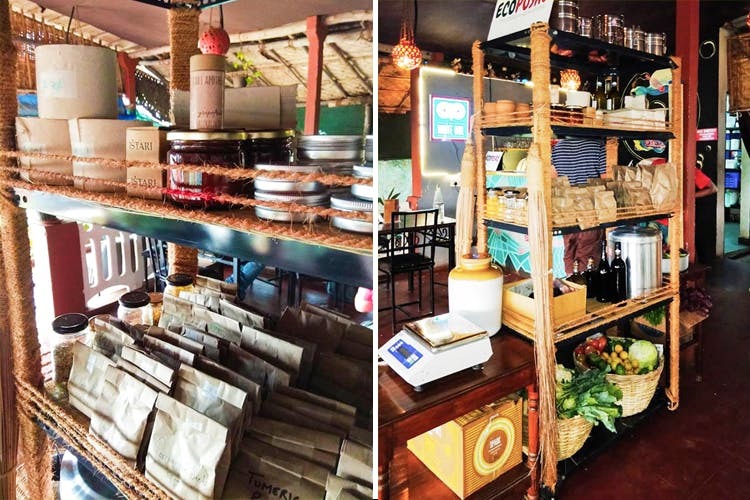 EcoPosro came to the state’s rescue when they opened their zero waste eco store in Goa. It is Goa’s first ever store of its kind. Their mantra is Zero Waste, which means there is no use of plastic bags in any packaging or any kind of plastic jars. For now, they have a small outlet in Siolim, operating out of Eldou’s restaurant. However, there are hopes for a full-fledged store coming up in Parra soon. The idea behind the concept for EcoPosro is that they do not have anything plastic in their store. Walk into the store and anywhere you look, you will see a lack of plastics unlike you would in a normal store. They serve their items in glass jars and bottles, which you can bring your own or use the ones that the store provides. You can use these jars and bottles to refill anytime you visit the store. Even the tissue paper that you will find in EcoPosro is environmentally friendly. It is made by an NGO, which makes products that are recycled, upcycled, unbleached and all natural. All items bought at the store will be wrapped up in a newspaper rather than in plastics. Even the fruits and vegetables that are on display in the store can be bought and taken home but the condition remains the same- no plastic wrapping. All the items that you will see at EcoPosro will be packaged in biodegradable substances including a wide range of shampoos and groceries. The store ensures that there is no use of any wasteful plastic packagings right from the beginning of the manufacturing process till you take delivery of the products.